I am in charge of the food in my house. I shop, cook and serve the food. There is a lot of power in that. As you know, I have basically gone no gluten, no sugar and now one glass of wine. My family is mostly gluten and sugar free. This morning I made Thomas his shake along with smoked salmon, goat cheese, ghee on the rosemary blender bread. He ate the whole thing. I could give him a bowl of cereal and he would eat that too. The smoked salmon is a much better choice for him. Thomas has had so many medical issues in his life. His health and well being is very important to me. He takes the best supplements on the planet as well. 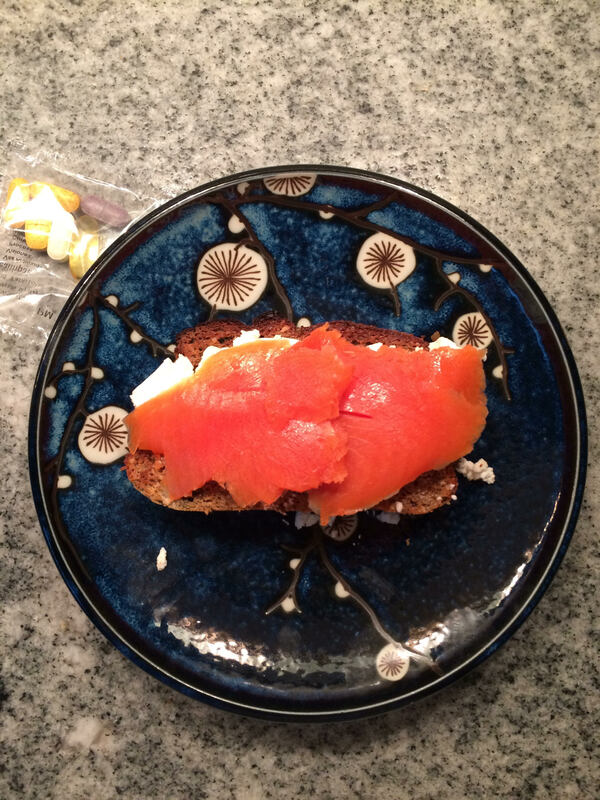 Smoked salmon , goat cheese, grain free bread! Great way to start your day! I have put together a 7 days…Feel Fabulous program with Holistic Chef Ivone. We have lots of great tips and recipes to share. We are creating a wonderful supportive community. Wouldn’t you like tons of energy and to be feeling fabulous? It is not too late to join us. Click here for more info. I slept through the night last night. What a blessing! Yesterday, I went out to lunch with my sisters, Mom and Dad. We are celebrating Mom’s birthday which is Saturday. We are having a dinner then. Yesterday was just a sneak preview. Coming off my 30 Days of no gluten, sugar, alcohol I have decided to be very mindful of what I am eating and drinking. My family all had wine with lunch and dessert. I had a wonderful time. I had a club soda with lemon and lime and coffee with no dessert. It didn’t bother me at all. I didn’t feel like I was missing anything. It feels like a HUGE Break through! Last night with dinner, I enjoyed my glass of wine. AND I slept through the night. I know keeping in Balance is Key! Remember SHMEC, your medical markers? Do you feel off? Not sleeping, Cravings? Tired? I have put together a 7 Day Jumpstart to feeling fabulous. NOW is the perfect time to start. You can change things around in a short period of time. I am here to help you along with Holistic Chef Ivone who will make sure you are eating delicious foods. It is So much more than Chicken breast and broccoli. Are you ready to invest in you? Click here. I made it! I did my 30 Days of No gluten, sugar or alcohol! Today, I can have champagne for breakfast. You know what? I feel so good I am going to continue on a modified journey. I am not placing rules on myself. This was my breakfast today. Grain Free Sugar Free Blender Bread with ghee. 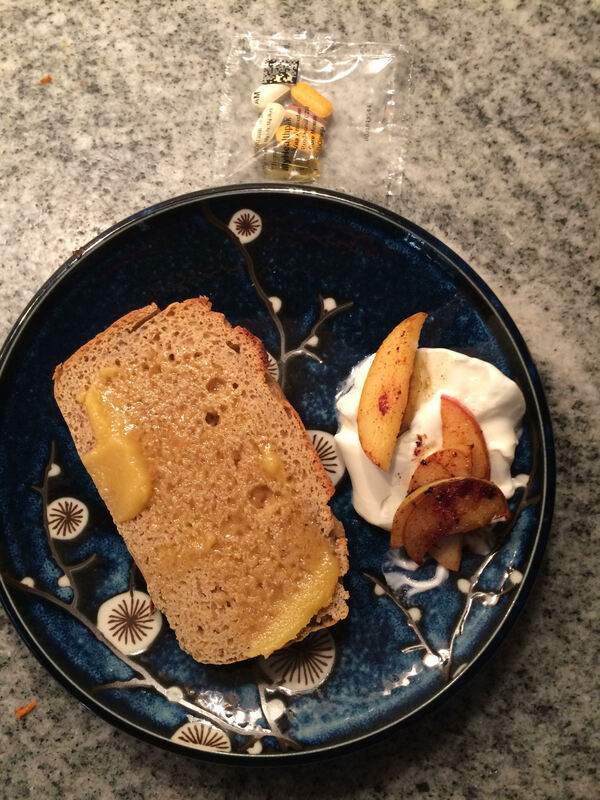 (recipe from Danielle Walker’s Celebration Book) Full Fat plain yogurt and apple sauteed in ghee. Along with Bulletproof coffee and the best supplements on the planet. No Grains, No Sugar BREAD! Martini Powered PJ and Julia! Today was a proud day for me. My Dad took my advise and embraced the Fit and Fabulous Nutrition Program! My niece Julia has been on the program for over a month. She talks about how her stomach has never felt better now that she is completely off gluten. She also loves how the program has actually helped her save money. It makes me happy that they are doing so well and I appreciate their trust in me. Here is their stories! A fun video to film today! I Love Katie Horner’s (another fabulous niece) art work in the background! Thanks Mom for being our photographer! Day 21 of No gluten, sugar, alcohol! Here is a quick video with Chef Ivone talking about her experience with our 30 Day Program. A 7 day program of No grains, sugar and alcohol with my friend Chef Ivone of Healthy Sage. Do you struggle with hot flashes, not sleeping, weight gain, cravings, and extra belly fat? Are you tired in the afternoon and searching for a treat? Are you tired of it? Do you feel like you can’t do anything about it? I am here to tell you that you can start to feel a difference your first week. We will give you recipes and tips to support you during the week. Delicious coffee will be served and maybe even a no grains, no sugar yet scrumptious treat! Happy Health Hormones Day 11! The NO sugar, gluten , alcohol 30 day program reduces the inflammation in your body. I have noticed that I don’t have aches and pains that come and go for me in the past. Do you have issues with aches and pains? Many people think this program is too hard. What is the price of waking up achy every morning? Or not sleeping well? I am eating really clean but I know I can’t possible get everything I need from my diet. It is so important to take a high quality pharmaceutical grade supplement to fill in any of the gaps in your diet. I am also including a liver support during the 30 days. Everything goes through the liver. I want mine to be supported, happy and working well! Here are the links to the supplements. It is an investment in your health! You are worth it! Balance Your Hormones Day 8! I always feel better after a workout especially one of my outdoor workouts with other people. Do you want Happy Healthy Hormones? Hang out with happy healthy people! Do more than hangout, workout together. THE BEST! This video is from our Saturday Morning workout. I wasn’t holding the camera horizontally. Sorry. It was a wonderful early morning workout with friends… Cold and sunny too! 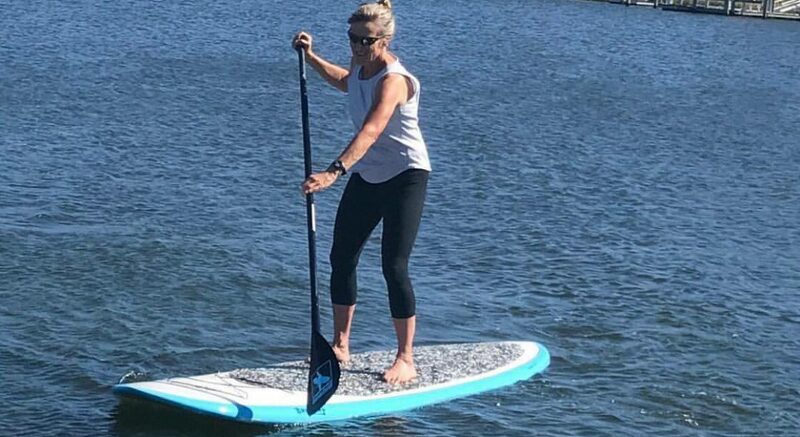 Click here to learn more about my outdoor workouts. Balance Your Hormones Day 4! Exercise! Some people love it and some people hate it! It has always been an important part of my life. It brings me joy and happiness. I have met some many of my friends through exercise. I met Christa, my OutdoorFit business partner at a gym years ago. I have such a great community of women that come to my classes. They have become friends with me and with each other. 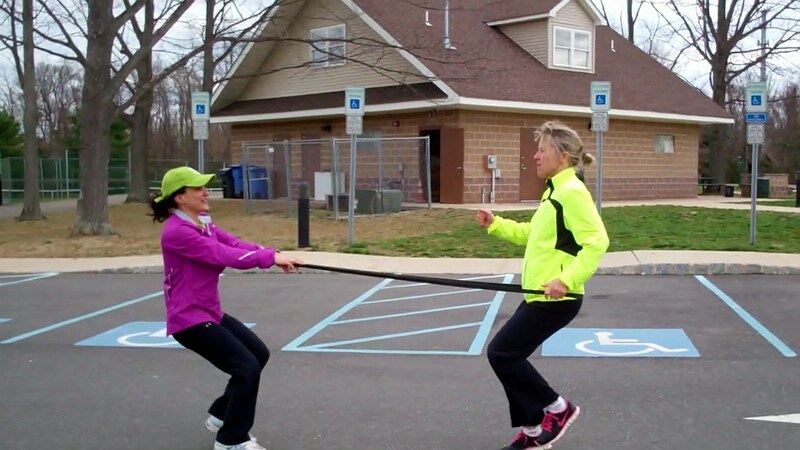 Resistance band training with Christa! I am off track of the subject or maybe not. Joy , happiness and a supportive community are an important component of hormonal balance as is exercise. Exercise is vital for health and may reduce some of the problems associated with hormonal imbalance. Issues like not being to sleep, weight gain, mood swings, and overall irritability. Find an exercise that you love and do it. If you can get outside, even better! Are you local? Come try a workout. Here is to Day 4! I am so grateful to the ladies that show up for the workout on a cold December Morning. The average age today was 67! (They said it was okay to post.) No Limits, No Excuses. Just keep moving!